The original Bourne Identity may have been blighted by a well publicised troubled shoot and shuffled to an initially leisurely box-office start, but once it hit DVD the movie really took off, buoyed by fantastic word of mouth. There’s every sign that The Bourne Supremacy will repeat the trick and deservedly so, the second adaptation of Robert Ludlum’s novels hitting just as fast and furiously as the original ever did. As the movie opens, amnesiac ex-assassin Jason Bourne (Damon) and his girlfriend Marie (Potente) are living in blissful solitude in Goa. Yet they exist with the permanent threat that Bourne’s past may one day catch up with him. And then one day it does, the appearance of a ruthless assassin spelling the end of their happiness with alarming swiftness. Bourne finds himself framed for a murderous operation by renegade CIA agents and, once again, needs to employ all his experience as both spy and killer in order to stay one step ahead of his enemies. The Bourne Supremacy hurtles along at such a breakneck pace that you’re never given time to realise that at heart this is a really rather simplistic plot made to look much more intricate than it actually is (though anyone who hasn’t seen the original may be left slightly confused over what the hell is going on). But it matters little. Paul Greengrass, taking over directorial duties from Doug Liman, gives the whole enterprise a pleasingly muddy visual style, and the handheld camerawork and rapid cuts perfectly capture the paranoid, disorientating world that Bourne inhabits. Damon, meanwhile, again proves to hold his own as an unlikely action hero, his somewhat vacant aura well suited to conveying Bourne’s uncertain identity. Bourne himself is the kind of morally ambiguous protagonist that could have leapt straight from the heyey of 70s Hollywood. Confused, violent and with a deeply murky past you just can’t predict how far he will actually go – witness the scene where he snatches Julia Stiles after an agreed rendezvous; for a moment it’s almost impossible to detect what the outcome will be. 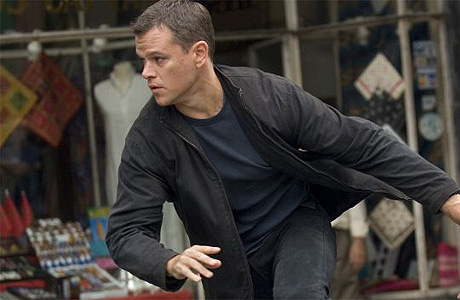 If it was in the car chases and action scenes that really saw The Bourne Identity come into its own, the sequel is thankfully just as impressive. From the bustling streets of Goa to the underpasses of Russia by way of a violent apartment showdown, the scenes are all the more exciting for appearing realistic rather than relying on James Bond-style cartoon heroics. Indeed, after the recent lacklustre couple of Bond adventures The Bourne Supremacy shows how a spy film should really be done. A more pertinent reference point in fact might be the Harry Palmer movies (The Ipcress File, Funeral In Berlin and Billion Dollar Brain) – movies that, while sprinkled with humour, hold a bleak, paranoid worldview that tap into an inherent audience unease with global politics and the shadowy agencies that work at its fringes. Both Greengrass and Damon have reportedly signed on for the adaptation of Robert Ludlum’s third Bourne novel, The Bourne Ultimatum. On the strength of both films so far, this can only be a very good thing indeed.